Info "Keep enemy hands outta your cake." 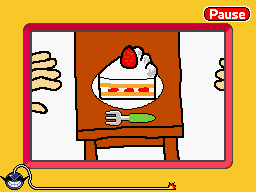 Cake Defense (spelled Cake Defence in the European version) is one of Ashley's microgames in WarioWare: D.I.Y. The point of the game is to protect the piece of cake that the hands are going for. The player needs to tap the hands that are going for the cake in order to protect the dessert. If the player manages to keep the hands of the cake when time runs out, the game is won. However, if one of the hands manage to grab the cake, the game ends in a loss. The piece of cake and a hand that appear in the microgame appear on the game box cover. This page was last edited on July 17, 2018, at 09:46.